The artwork Light Gig shows drawings of running horses with LEDstrips. It was created by Giny Vos and is located on a big wall next to the entrance of the movie theatre LantarenVenster in Rotterdam. LantarenVenster is a movie theatre offering an arthouse movie program. It is located on the Wilhelminapier in Rotterdam, a vibrant part of Rotterdam with high�rises, restaurants, museums and hotels. Light Gig refers to the rich history of moving horses: From the prehistoric cave paintings, to the Muybridge photo series, Western cowboy movies, and now also contemporary urban public space. The LEDstrips look like the hasty scratches that were made in the celluloid film of early movies. Because the LEDstrips turn on and off quickly the illusion of motion is created, and it looks as if the horses are actually running. Light Gig is located next to the entrance of LantarenVenster in a narrow glass hallway. The artwork is 21x7,5 meters and thus has the dimensions of a movie screen. It is visible its entirety when standing on the other side of the street, and gives the passerby a modern urban cinematic experience. 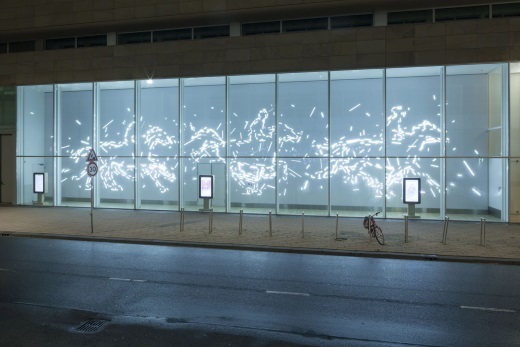 The animated light drawing series is 27 minutes long, so the viewer sees different sequences of motion when passing by. The construction was produced by Invent Design, Gielissen, and Bart�Jan Hooft. The animation was done by Bram Verhavert. Giny Vos works with large�scale installations in the public space. She makes use of light and new media. Taking the specific place as her starting point, Vos creates images that make aspects or processes visible within the environment that would otherwise go unnoticed. Processes are just as important as physical aspects, and are reflected in the use of movement, light and digital displays. In this way, Vos � literally and figuratively � reveals the given situation in a different light, leading to the creation of a new situation, but without obscuring the existing one.